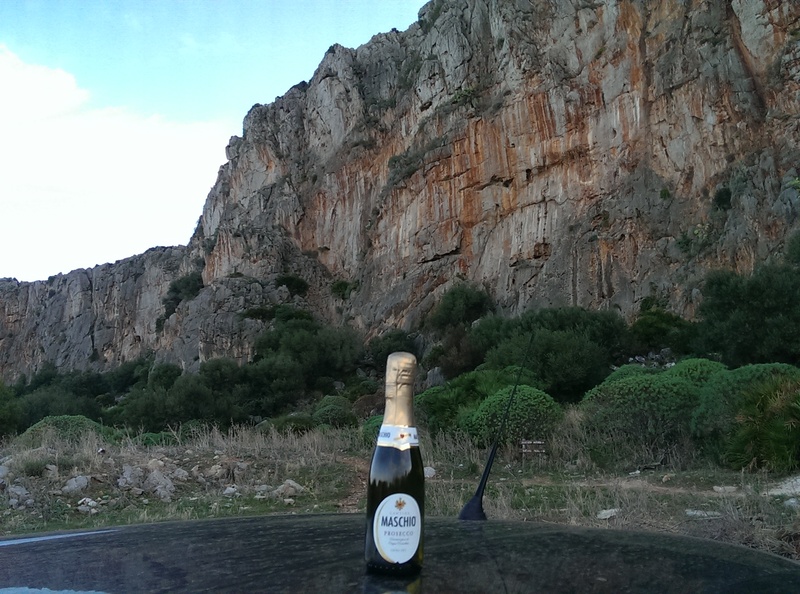 Bonus Days in Sicily – long report!! On Monica’s and Michal’s last full day in Sicily Rob and I set out very late for climbing. At around 12.30pm we reached our chosen sector near the camp site El Bahira, called Torre Isulidda. That was also very convenient for my friend Grainne, who stayed on this campsite with her family. After Rob and I did a 6a warm up called “Red Bull”, Grainne joined us for two climbs (6a+ Destra Di Toro & 6b+ Grazie Michele). All excellent routes! After that, Grainne left us to go for an ice cream with the kids (I can’t blame her..) and we continued climbing. We just walked around the corner into a cave. There was a 6c climb I wanted to tackle (Tower Route Direct?). Half way up I had to give in and Rob made it to the top instead. After that we climbed a pleasant 6a (Tower Route). 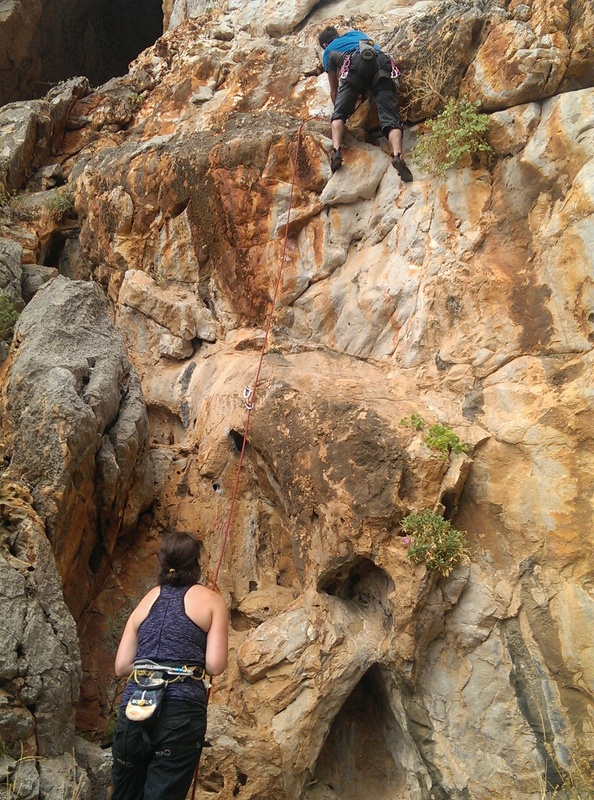 The trick on this one was that it had a long traverse route (about 6 m) which was a bit risky to unclip.. Rob did so with bravour! Since we had a late start in the day we ended up coming back late, too. And therefore missed having our farewell dinner with Monica & Michal. But we also enjoyed the last night of the climbing festival in town. Luckily, we didn’t have to go to the airport on Sunday. 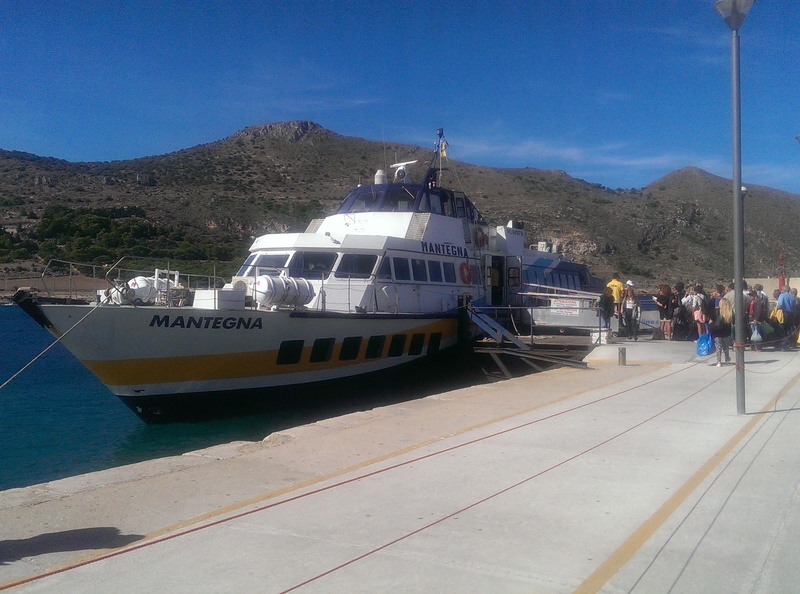 So we decided to go and visit Favignana Island – one of the highlights of the entire trip. Its a one hour drive to Trapani and then you take the fast ferry, which bring you over to the Island full speed in as little as 30 minutes. We decided to stay in Favignana for one night and booked an Airbnb. We got an upgraded accommodation, totally different to the one advertised. And ended up having our own big private pool. We didn’t spend much time there, but at least both managed to jump into the pool once. 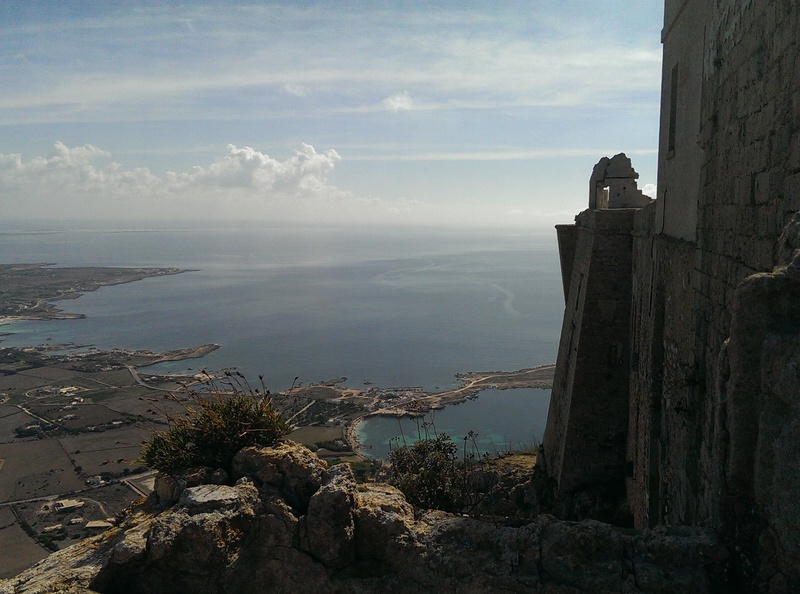 We hired a moped and had lots of fun discovering Favignana that way. 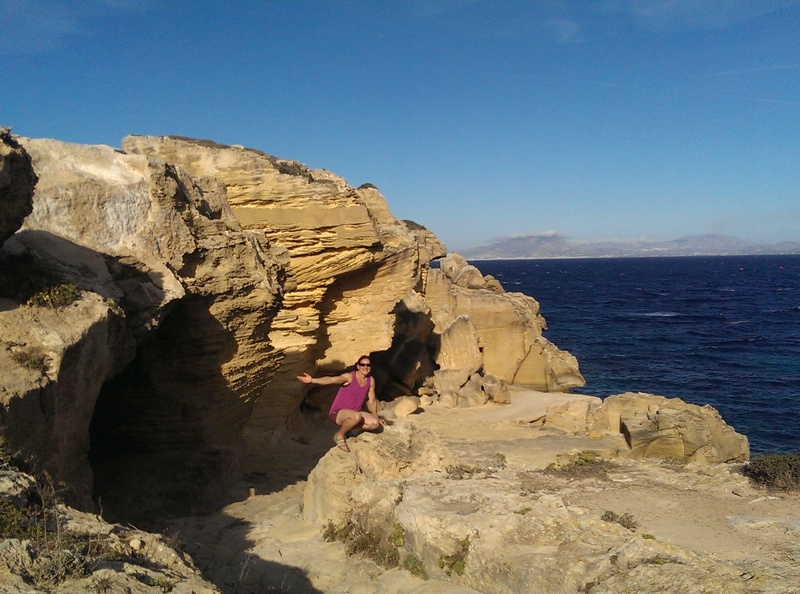 Great caves, bays and amazing sun set! Bue Marino and Casa Rossa was absolutely fascinating! Next morning we visited some deserted building up a 350m high hill just outside the village… It took us many many steps to get there in the heat. But every bit was worth it! Even though we changed our tickets for a later ferry, we nearly missed that one, too. If you ever plan to go to Favignana, plan at least three days to get to really enjoy what the island has to offer. On Monday afternoon we were back in San Vito del Capo. We stayed in a different Airbnb then before. Close to town and the beach, bikes to our disposal. So off to the beach we went to cool down from all the heat. On Tuesday, for what we thought would be our last day of climbing, we went to Section Scomparto Rifiuti. Also close to the campsite of El Bahira. We climbed two routes (Rumanian Girls 6a, Grey Wall 6a). After that Rob convinced me to take a rest after that (I was reluctant as we had only warmed up!). But when we went down for a swim on the bay just below the climb, I had to admit that it was a brilliant idea after all. The heat was still on and it was hard to climb in those conditions. After the refreshing dip and some lunch we came back to the routes. I decided that we had to put some more effort in our climbs and really wanted to get at least one proper 6c in (after dismissing all visions of climbing a 7a on this trip). We did another two routes first (Lisa 6a, Kurt 6b+) before we tackled the so called “Best 6c Route in San Vito del Capo: La Bella Vita. It has two pitches: 15m (5A) and then 30m (6c). You could just sramble up the first pitch and climb from there. There were a lot of lose rocks on the first pitch, be aware! That 6c was an absolute amazing experience. Every move had some challenges, but if you get it right, there is always a hold waiting for you. Some undercuts, overhangs, jugs, crimpy parts. All you can ask for. So that’s what we did then. Up at 6am, at the crack for 7am. 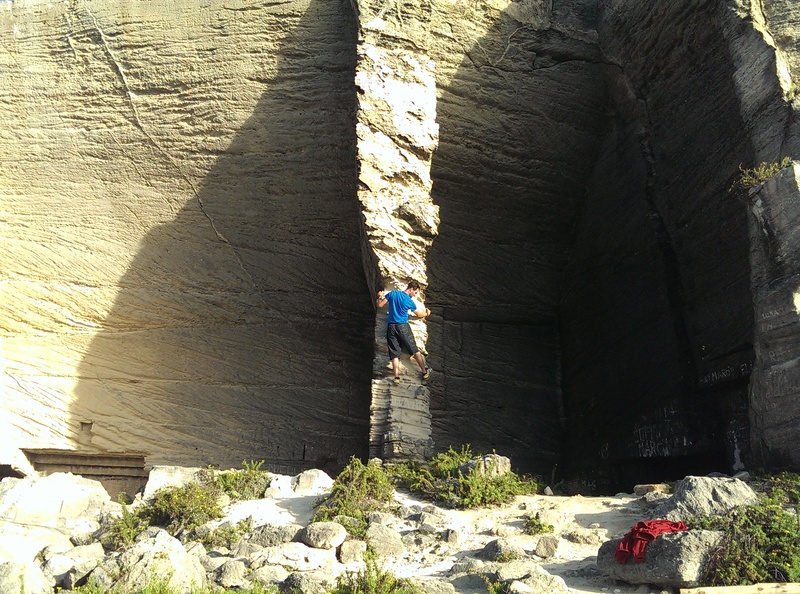 One “warm up climb” (Kurt 6b+) and straight into this amazing 6c route. I can only say that “La Bella Vita” has absolutely earned the title for best 6c in that area! And thanks Rob for getting up that early to give me a second chance! The perfect finish of this holidays! We even made it in time to the airport for our 11.15am flight with Rob racing like a mad Italian gun shooter!